What do you do when it’s 96 degrees outside and you didn’t bring a lunch to work? You order in! Yes, that’s right folks, me and a couple of coworkers were too chicken to face the heat and humidity by getting in our cars to seek out food this afternoon so instead we had some delivered from Spice & Rice in Cambridge (Inman Square). It was funny because after I dropped my husband off at work this morning, I thought to myself, “Hmmm, I could really go for some sushi today,” but then I thought, “Gee, where can I drive to later on this afternoon to get some?” So then I kind of just let that thought pass through my head because I remembered it was going to be 1,000 degrees outside, and there aren’t that many places near our office building that I could just stop in for a take-out order. And then later this morning one of my coworkers stopped me in the hallway and asked if I knew of local restaurants that delivered because she, too, didn’t want to face the sun. Luckily, I convinced her to go with Spice & Rice so that I could [selfishly!] have some sushi. It was definitely worth the $2.00 delivery fee. And yo yo, did I have some sushi! 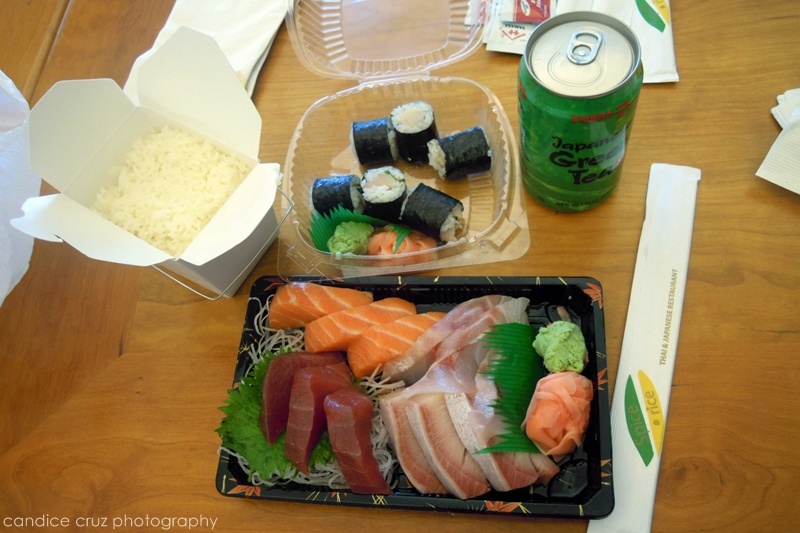 I ordered the sashimi special which came with 12 pieces of sashimi plus a little box of rice on the side. It was pretty good sushi for only $10.95! I also ordered some Negihama maki (yellowtail rolls, $4.95/6 pieces) thinking that the sashimi wouldn’t be enough, but I was very wrong. It all washed down quite deliciously with some cold green tea, too. One of my friends ordered the bulgoki special lunch box ($7.95) and man, that was a lot of food in one cute container! 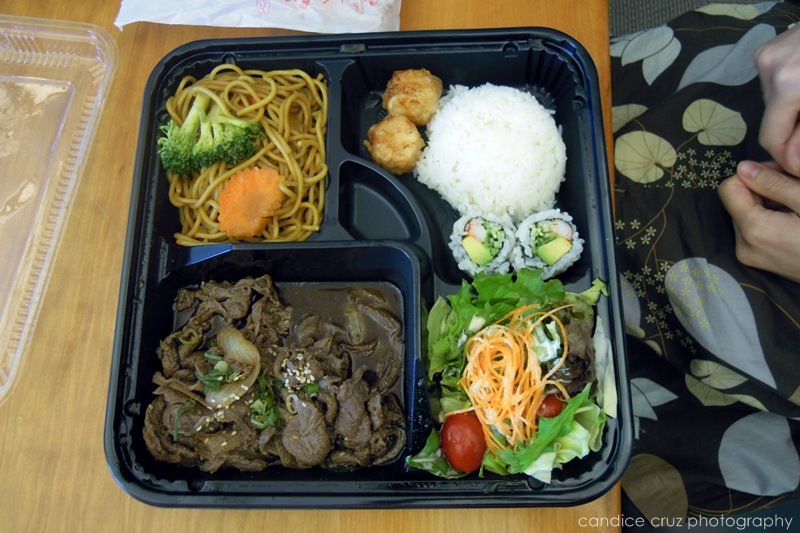 The marinated thinly sliced beef came with a California roll, shumai, yaki soba noodles, rice and a salad. She said it was good, but too much to finish in one sitting. Our other friend had the vegetarian pad thai ($6.95) with tofu instead of chicken and said that it was “okay, not great”. Again, a big enough portion for her to have leftovers for tomorrow’s lunch too. 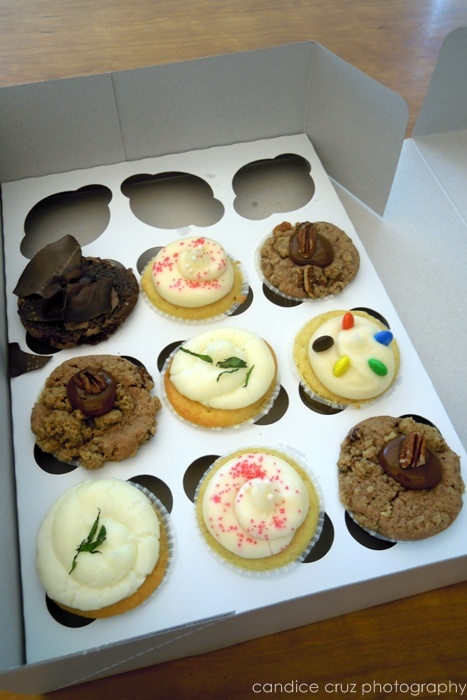 This entry was posted in Cupcakes, delivery, japanese, Kickass Cupcakes, korean, lunch, restaurant, spice and rice, sushi, thai by shortcakescraps. Bookmark the permalink.